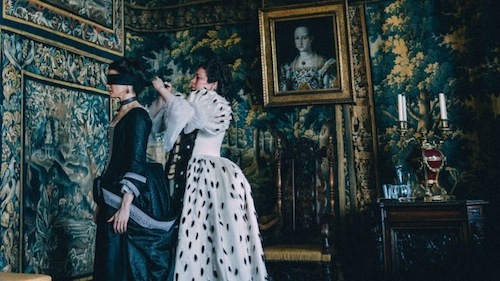 Magnificently directed by Greek director Yorgos Lanthimos (Dogtooth; The Lobster; The Killing of a Sacred Deer), The Favourite is a sumptuous historical comedy-drama and feminist extravaganza. It narrates the unmeasurable thirst for power of two cousins, Lady Sarah Churchill (Rachel Weisz) and Abigail Hill (Emma Stone), who engage in a battle with each other to earn the favoritism of the whimsical Queen Anne (Olivia Colman) of Great Britain in the early 18th century. When Abigail, a former aristocrat turned servant, arrives at the royal house, she finds her duchess cousin Sarah enjoying all the authority bestowed by the queen, who, besides insecure and unstable in regard to the country’s affairs - England is at war with France - is also suffering from both physical and psychological illnesses. After finding out that Sarah and the queen maintain a secret affair, Abigail sets a strategy to conquer the power and get rid of her cousin, whose absence related to important war deliberations only expedites her plan. Jealousy and hatred play big in a film where men are relegated to a second plan. Broadening his vision and maturing his signature style, Lanthimos skillfully weaves the threads of a story that never stops to amuse us in a sort of mundanity-meets-elegance. The pair of writers, Tony McNamara and Deborah Davis, thoughtfully crafted a story whose wittiness, cynicism, and madness helped to transform The Favourite in one of the most impressive works of 2018. Shot with sophistication, this unconventional period film is a triumph in many ways. It showcases an off-kilter sense of humor and a special conglomeration of carnality, darkness, fragility, and opulence. The superlative performances from the ensemble cast set this venomous female triangle on fire. If Stone and Weisz are extremely qualified in their roles, Colman is a marvel, playing the childish, solitary queen with so much artfulness and brilliance. The production values are absolutely formidable, including the set and custom designs, the convenient soundtrack with Baroque, Romantic, and contemporary classical music, and the stunning cinematography by Robbie Ryan (I, Daniel Blake; Fish Tank). Furthermore, I’m glad that the bold, inimitable Lanthimos didn’t lose the power to shock and captivate at the same time, a staple in his filmography.